A cartouche is an ornate or ornamental oval or oblong figure (as seen on ancient Egyptian monuments) that encloses a sovereign's name, such as a Pharaoh. 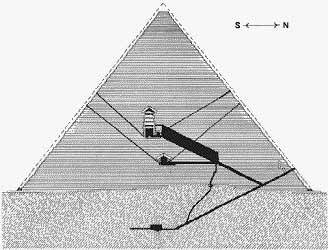 Cross-section diagram of the Great Pyramid depicting a descending subterranean passage, an ascending passage (the Grand Gallery) two chambers named the "Queen's Chamber" and the "King's Chamber" and four (air?) shafts. Located directly above the King's Chamber are five, granite, stress relieving chambers. 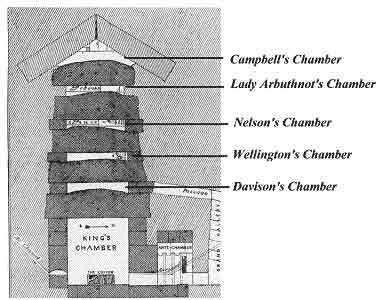 Their structural function was/is to prevent the collapse of the King's Chamber from the tremendous weight of several million tons of the superincumbent masonry above the chamber area. These four upper chambers were discovered by Col. Howard Vyse in 1837 and named by him.